If you must know one thing about me, know that I love pizza. Not a little love, it is a large immense love that never dies down. Pizza with salad. Pizza with soup. Pizza with fries. Pizza for breakfast. Pizza for lunch. Pizza for dinner. Pizza alone. Pizza party, etc you get my drift. Pizza is my bae. When I was young, my mom made pizza, now it’s my duty when I’m home. Since I’m living on my own I realized 1) I don’t need to buy whole shells like I do when I make it for my family. 2) I probably don’t have enough freezer space (you know roommates and all) In the fall of last year I came up with a solution that has worked PERFECTLY and DELECTABLY and I’m here to share. Pre heat oven to 385. Cut your veggies and leave them off to the side, you’ll need them shortly. Have garlic separate. Pour some extra virgin olive oil in your warm-to-hot sauté pan and add garlic. When the garlic becomes fragrant, (1 min.) throw in your cut veggies. You do not want to cook these long because you still have to put the pizza in the oven. Sautee for 2-4 minutes stirring occasionally so the veggies are cooking evenly. Spread your sauce and add cheese to your liking. Top the sauce and cheese with your veggies. Pop it in the oven on the bottom shelf for 15-20 minutes or until the bottom shell has a golden tint to it. Cook time will vary. Let it cool for few minutes, then cut and enjoy. I usually eat one. At one point I had the smaller mini tortillas and I would make 2-4. For the bigger ones I make 2. They are so easy and quick, not to mention healthy and delicious. I know there is debate about cheese (dairy in general) for your heath, so I really don’t eat dairy that often. In 2014, this is the first time I’ve bought cheese and it is the first of March so I don’t mind using “real” cheese. I love mozzarella on my pizza because it melts so great. I am not a cheese connoisseur so I usually use cheddar or a cheese mix. If you do a Mediterranean pizza mozzarella is the way to go. ** If you want to use spinach, don’t sauté it! Sprinkle on top of pizza when you have 3-5 mins left to cook. Eventually I want to try a cauliflower crust pizza (another link) and a sweet potato crust pizza. ENJOY! Share it & if you have any questions please feel free to ask! 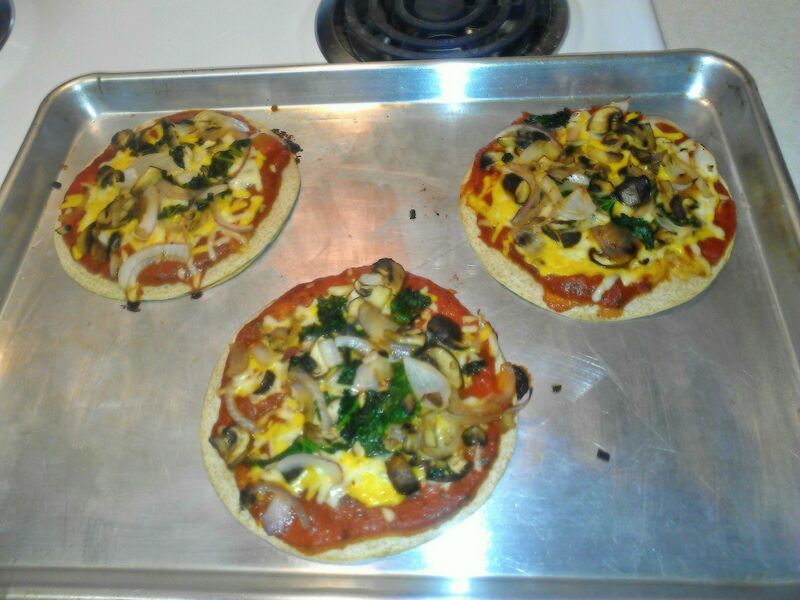 This entry was posted in Recipe and tagged dinner, healthy meals, pizza on 03/01/2014 by The Tenth Muse.